Holi is the festival of colors, joy, fun, frolic and fiesta. It is the most celebrated time of the year and is celebrated by every community in the country. 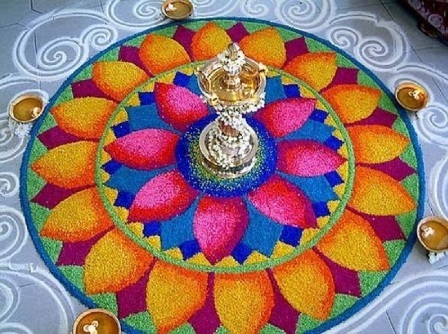 However, playing with colors is not the only thing that people do, they also spend time with family and friends, go for parties and create Holi rangoli designs. If you are looking for some nice designs for this years Holi, we have enlisted some good suggestions for you in the following paragraphs. 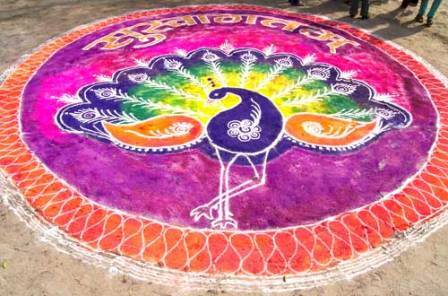 Here are the 9 best colourful Holi rangoli designs and pattern with images. If you are organizing a Holi party with family and friends, this is the design you should use to bring out the festivity. It shall surely be the life of the party and the guests will definitely not stop praising you. The colourful petals here are marvellous in appearance and the patterns used are outstanding. 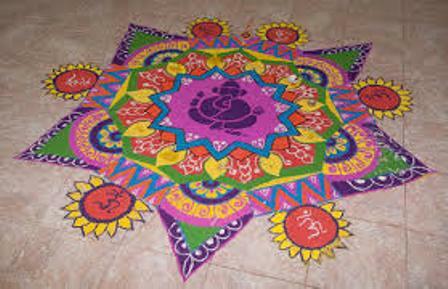 If you live in a joint family, you should definitely try creating a Rangoli with all your family members. It will bring you closer to one another and you will also enjoy yourself a lot while creating this. The colours here are super bright and the patterns are authentic and very Indian. To make your Rangoli design unique this Holi, use the Peacock design. 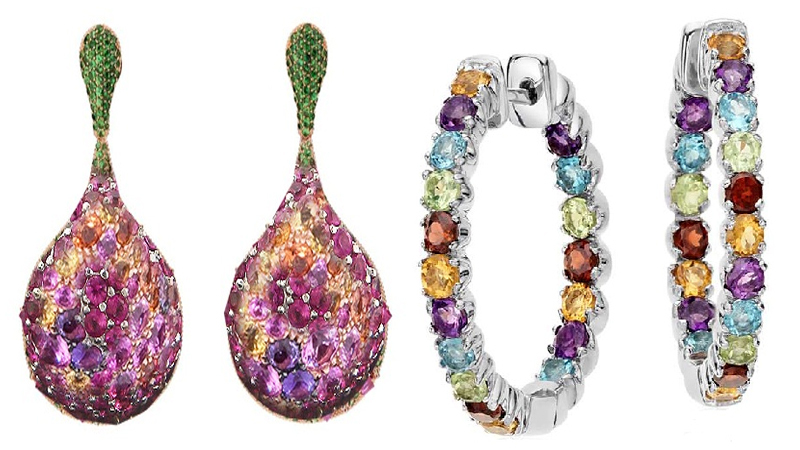 It truly resembles a royal piece of art and looks very rich and extravagant. It is extravagant in appearance and very beautiful. The shades used are vibrant and the best part about this design is that it looks splendid with all the colours merging into the other. Holi is one of those cheerful festivals that cannot be celebrated alone. You will definitely need your family and friends. Therefore while organizing such an occasion, you will definitely need a design that is big and is very suitable for the occasion. 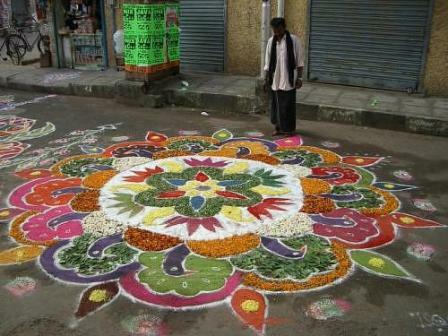 For that, you can use this giant Holi Rangoli Design. It will surely surprise the spectators in a pleasant way. A Holi Rangoli Design that reflects the rich culture of Hinduism is surely what you need to make this festival auspicious. You can use the image of Lord Ganesh in the center and surround it with gorgeous and attractive patterns. You can also use the Om symbol in the corners to highlight its beauty. 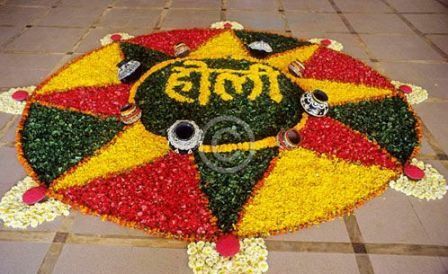 You can always use a Rangoli Design for Holi by writing the name of the festival in Hindi itself. It shall really look beautiful and appealing to the eyes. You can use rose petals and leaves to create this design. 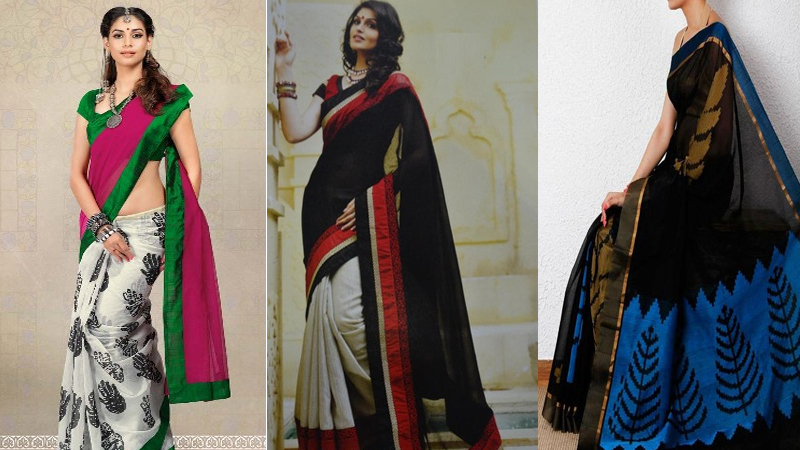 Use geometrical shapes and patterns as they look best. 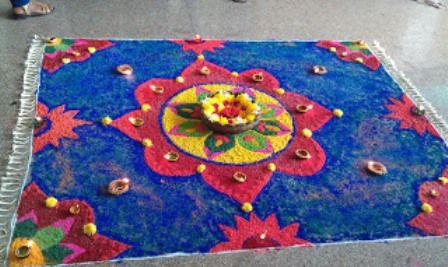 Your Rangoli design for Holi always doesn’t have to be old. You can make it look modern and fashionable by using new patterns and modern shades. The style in which it has been constructed also looks very beautiful. Surround it with lamps and use white chalk to create more authentic patterns. 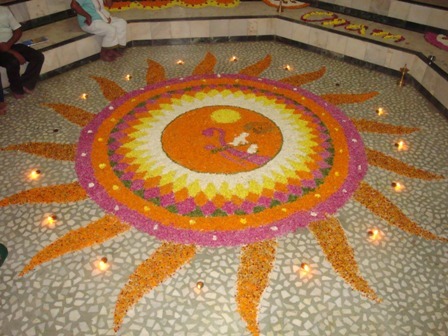 You can use the sun to create a cool and amazing rangoli design this Holi. Use orange and yellow as the border and create long and twisted lines which will act as the light which is emanated from the sun. Also draw a pretty looking flower in the center to accentuate its charm. 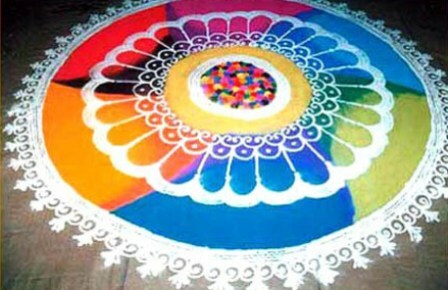 If you create a nice Holi Rangoli Design on a carpet, you will surely steal the show. 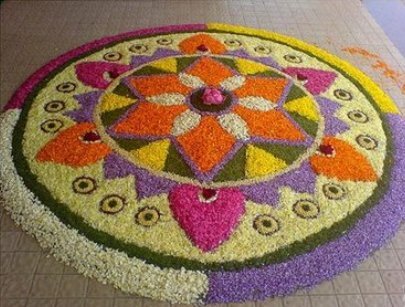 Make unique shapes and designs and place the flower petals in a stylish and attractive way in the centre. 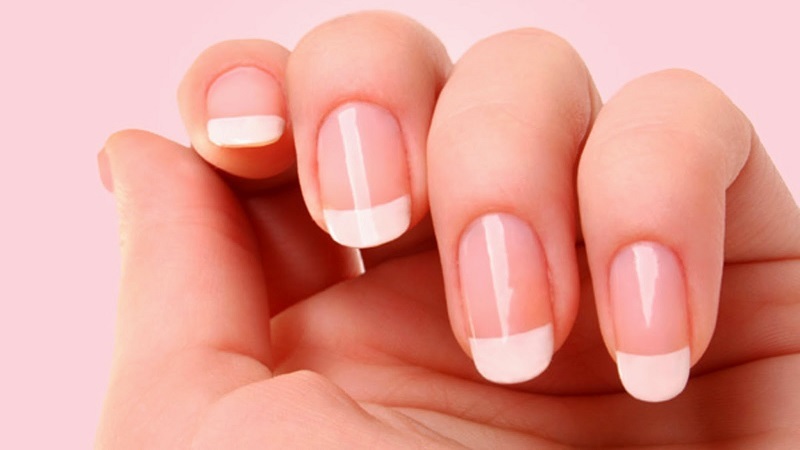 How to Remove Acrylic Nails?